Morning ride on the 100-year-old steam train traversing through lush Victorian rainforest, be delighted by the beautiful fern forest and local flora. Enjoy a delicious lunch in the tranquil town of Emerald or Healesville, better yet at a Yarra Valley winery. 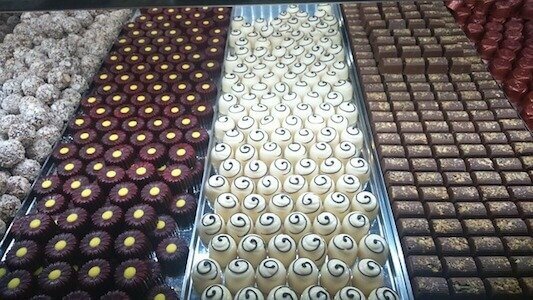 For dessert, indulge in some flavourful chocolates and gelato from Yarra Valley Chocolaterie & Ice Creamery. 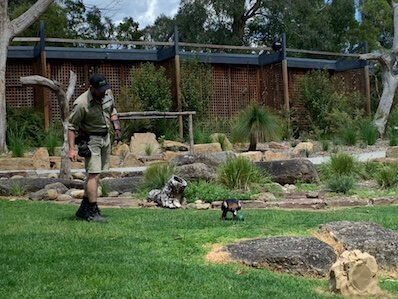 In the afternoon, visit native Australian animals at Healesville Sanctuary, watch koalas, kangaroos, platypus at close distance, be inspired by the wildlife hospital at Healesville Sanctuary. Enjoy fun outdoors activities at Mt. Dandenong & Yarra Valley. Let’s Go To Mt Dandenong! Yarra Valley, Here we come! In the morning, our friendly driver will pick you up from your hotel. 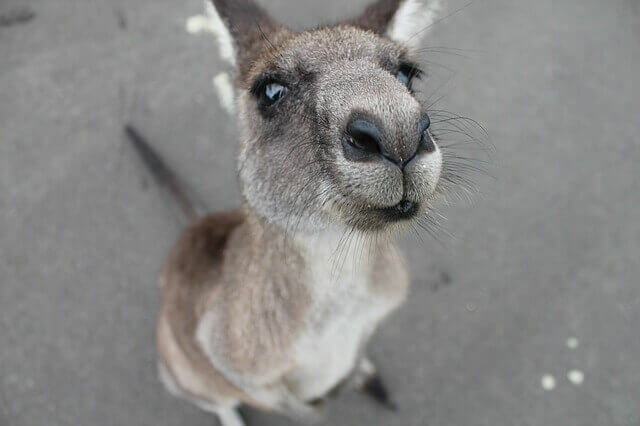 Travel Easterly from Melbourne, Puffing Billy is about an hour’s drive from Melbourne CBD. 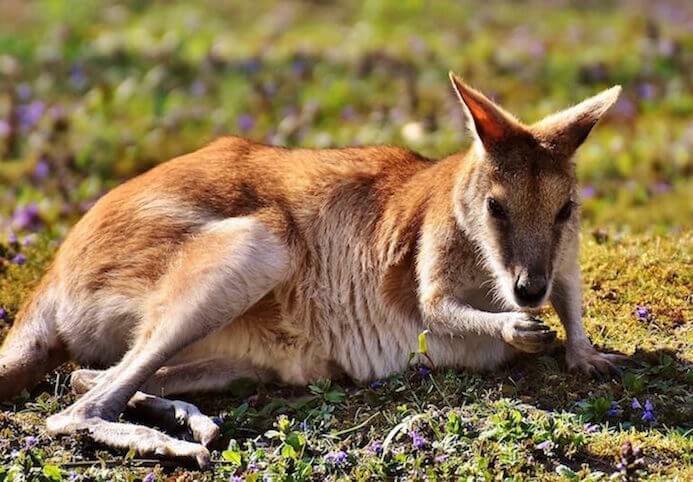 Puffing Billy and Healesville Sanctuary trip is a perfect relaxing getaway for family where you will see the best of Mt Dandenong and Yarra Valley with less focus on wine tasting. In addition beautiful vineyards, you will get to taste freshly picked grapes and sight falling autumn leaves between March and May. 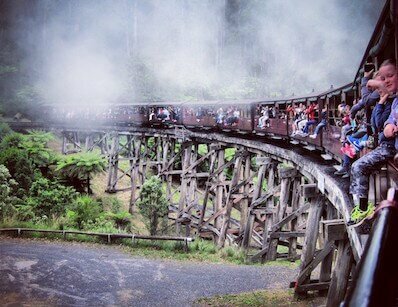 Puffing Billy steam railway traverses through the lush rainforest of Dandenong Ranges. The steam train first operated in 1900, mainly for the transportation of local agriculture and logging products. The original starting point, Upper Ferntree Gully, has now become Belgrave. The railway has five platforms, namely Belgrave, Menzies Creek, Emrald, Lakeside and Gembrook. A complete journey would take about 2 hours, and 25 minutes apart between each two stations. Due to severe landslide, the steam train operation had been suspended from 1953 and it wasn’t fully operational until 1998. 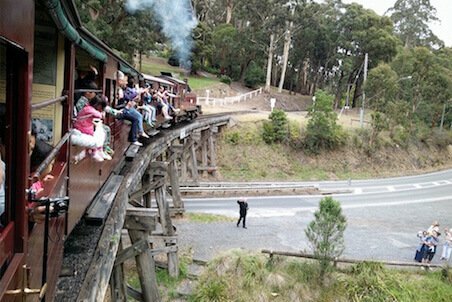 Since then, Puffing Billy steam train has become hugely popular with both local and international tourists. 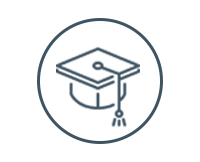 In recent years, annual customer flow has exceeded over 400,000. Puffing Billy has proudly maintained the original steam engines which feed on large consumption of coal. 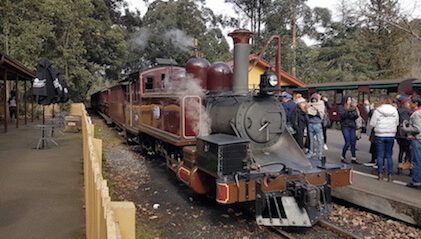 The steam trains traverse slowly through the lush Dandenong Ranges fern forest, visitors can choose to sit by the sides of the trains and dangle your feet outside the carriage. coupled with the fragrant scent from the local flora and fern trees, re-explore this historic trail wholeheartedly. One hour from Belgrave to Lakeside: AUD $ 36 adult / AUD $18 child (4-15 years old). Yarra Valley is one of the major wine producing regions in Australia. Its superior natural location, coupled with year-round cool climate and generous precipitation have made Yarra Valley home of more than 100 wineries of various sizes, range from small family-run wineries to internationally renowned Domaine Chandon and Innocent Bystander. 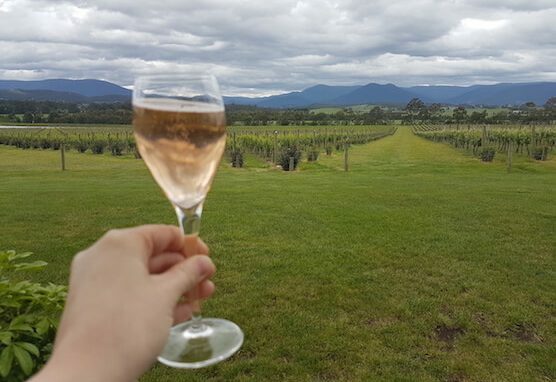 Yarra Valley is best known for its Pinot Noir, Sparkling Wine, Cabernet Sauvignon and Shiraz. Domaine Chandon is one of the most famous wineries in Yarra Valley, it has an alluring vineyard inspired by French horticulture. This French concepted winery was born in Yarra Valley in 1986 and is best known for its sparkling wines. The views from cellar door and in the vineyard are magnificent, the endless rows of grapevines, together with the calm lake in the backdrop makes Domaine Chandon one of the most Instagrammable spots in Yarra Valley. Domaine Chandon has a tasting fee of $12 with and $6 discount on any subsequent purchase. 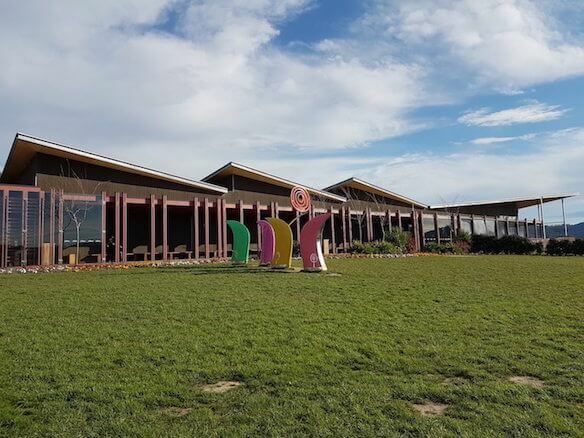 Oakridge was titled as Australia’s best winery in 2012 by local newspaper “The Age”, the term “Oakridge” originally came from a ridge of oak trees planted at the front of the vineyard. At the cellar door, enjoy the panoramic view of the entire vineyard while the aroma from wine wakes up in your mouth. 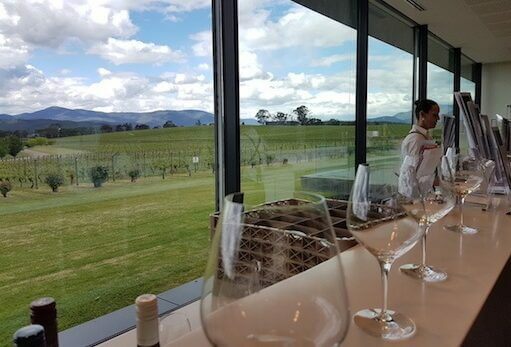 Yarra Valley is a gourmet paradise, many wineries have their own restaurants, serving mostly modern Australian and Italian dishes, our lovely guide will recommend restaurants based on your preferences. Savour the delicious food at Yarra Valley with fresh ingredients sourced directly within. 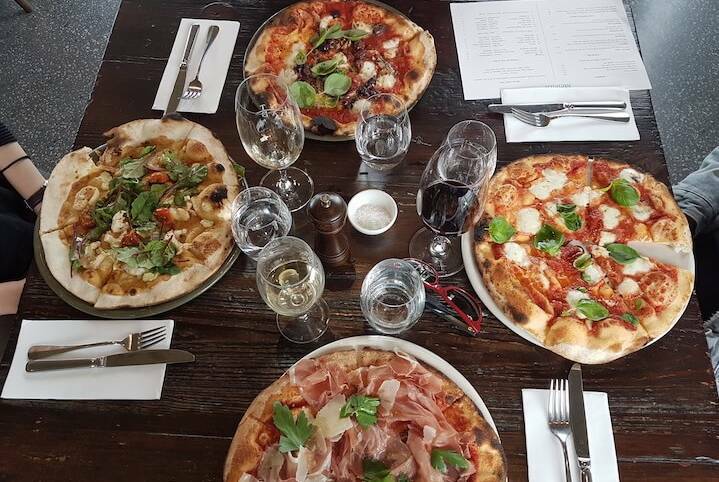 Meletos is best-known for its wood-fired pizzas, the restaurant makes consistently delicious pizza topped with fresh and organic ingredients sourced directly from Yarra Valley, it also serves various entrees and mains, making it one of the best choices for lunch. There are a number of great restaurants and brunch spots in Healesville and Emerald, just ask our friendly guide for a nice spot to dine! How can you miss desert after a satisfying lunch in Yarra Valley? 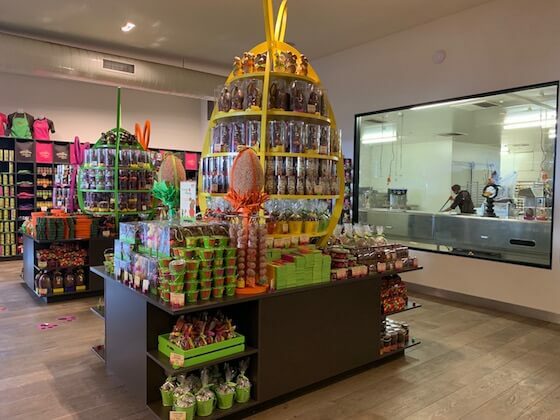 Yarra Valley Chocolaterie and Ice Creamery makes a wide variety of chocolates, from exquisite handmade chocolates of different flavours to meter-long gigantic chocolate bars, if you like Easter chocolate eggs, you can find them here year round, the premium range includes chocolates made from imported cocoa all around the world, chocolate truffles and etc; Behind the massive glass panel, you get to watch workers delightfully making flavoursome chocolates, Best of all, every now and then the chocolaterie introduces their new chocolates, with many of them available for tasting before purchase. The ice-creamery serves quality gelato as an alternative, with an additional stall set up around the carpark during summer. The terrance outside of the cafe is a good place for families to munch on some tasty desert while having some aromatic coffee. The chocolaterie features a gorgeous lawn that is great for relaxation and outdoors activities, kids love to run around and kick the soccer balls. Look afar, you will be delighted by the beautiful scenery of endless green pasture and moderate hills in the distance. 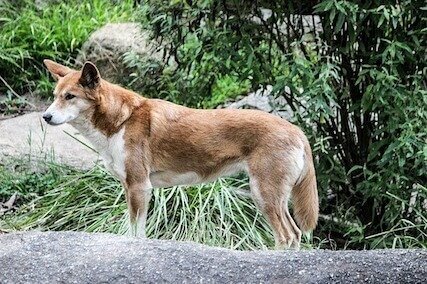 Healesville Sanctuary is a wildlife zoo located in Healesville, right on the edge of Yarra Valley. 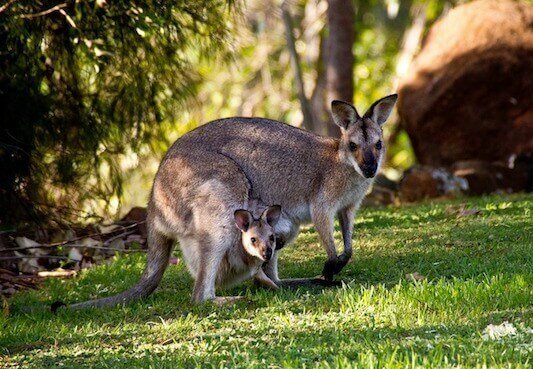 It is home to many native and endangered Australian animals, ranging from mammals, reptiles, birds and nocturnal living creatures. At Healesville Sanctuary, get up and close to cute wallabies and kangaroos, watch adorable koalas nibbling away at eucalyptus tree leaves; observe echidnas (also known as Spiny Anteater) crawling on the topsoil and sluggishly finding its mid-day snack; learn about the world’s 2nd largest bird behind ostrich – Emu and spot platypus swimming swiftly across the water. The footpaths within the zoo are shaded by dense gum trees and vegetations, it’s ideal for a good afternoon walk. Adult AUD $37 / Children (4-15 years old) AUD$ 18.50. Free entry for all children under the age of 16 on weekends & public holidays. Originally a cherry farm, the farm owner’s love for lavender in 1991 has over the years turned it into a sizeable lavender garden, with over 10,000 lavender plants. 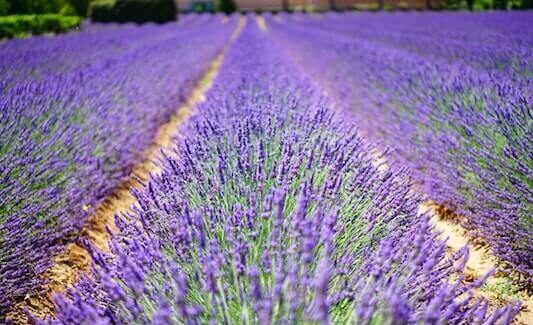 You can take a stroll in the lavender garden, breathe the fresh air and admire the beautiful lavender plants. In addition, the cafe serves special Lavender ice cream and delectable scones. The best time to visit is from end of November to end of January. There are many cattle farms in Yarra Valley, its green pasture produces some of the best dairy products in Australia. 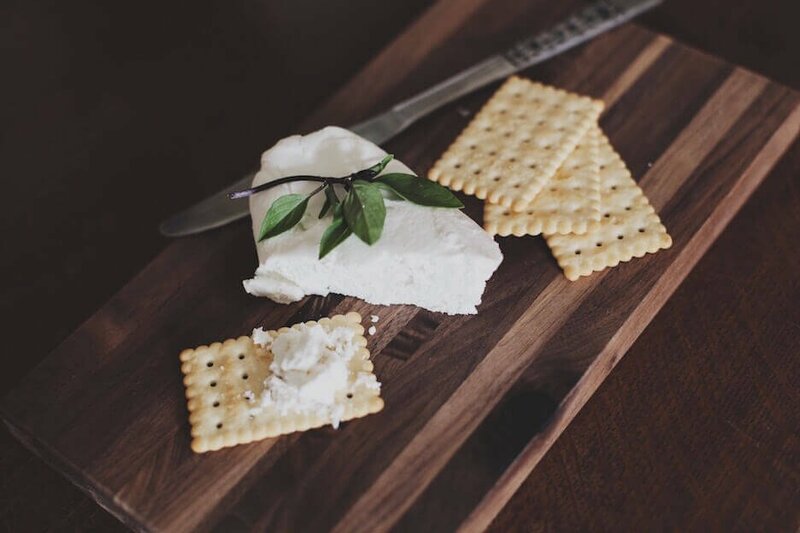 At Yarra Valley Dairy, you can sample locally produced cheeses while sipping on your favourite wine from the valley. There is a wide selection of cheeses to choose from, e.g. Gouda, Brie, Blue Cheese, Cheddar, marinated cheese etc. The dairy shop also sells fresh local farm products, such as: olive oil and jams. 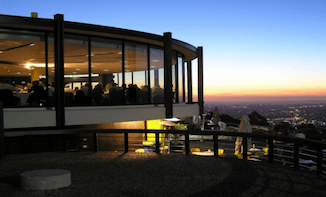 Skyhigh Mt Dandenong has multiple viewing platforms, provides visitors with panoramic views over metropolitan Melbourne and Dandenong Ranges. There are also a nearby bistro, a Giants Chair that is great for family pictures and Skyhigh Maze, a perfect place to lose yourself! There is a number of orchards and berry farms scattered around Yarra Valley. Especially in December and January, the juicy and sweet Victorian cherries, blueberries and strawberries are ripe for picking, roll up your sleeves and pick your own fruits. While you are picking, you can sample as much as you want! 1) Rayner’s Orchard has up to 450 different types of fruits ready for harvest at different times throughout the year, including peaches, plums, apricots, kiwis, lemons, citrus and many more. The orchard offers one-hour Tractor Tour, visitors can tour the entire orchard on tractor accompanied by its friendly staff. 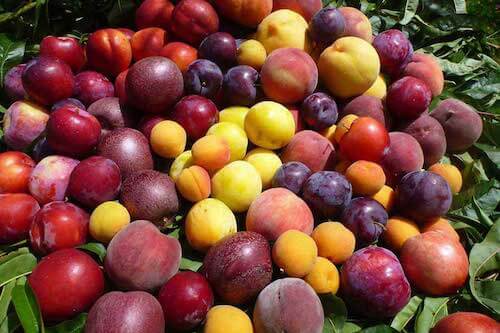 There are generally 8-12 types of fruits available for picking at any time of the year. The fruits you pick will be weighed and purchased at the end of tour. Begin in early December, the sweet and juicy Victorian cherries and strawberries become ripe for picking, this usually lasts about one and half months. until mid or late January. Blue Hill is a large cherry and strawberry farm located in Yarra Valley, you can also find rare varieties, such as: raspberries, blackberries, Boysenberries, Youngberries and Loganberries here. Yarra Valley is a winery region located 45 km northeast of Melbourne CBD, with Yarra River flows across it. Its cool climate has made it suitable for wine making, as a result, a thriving wine sector has been established in the region with more than 100 wineries. Yarra Valley offers a wide varieties of wine to match your palate. The region is well-known for shiraz, sparkling wine, chardonnay and pinot noir. 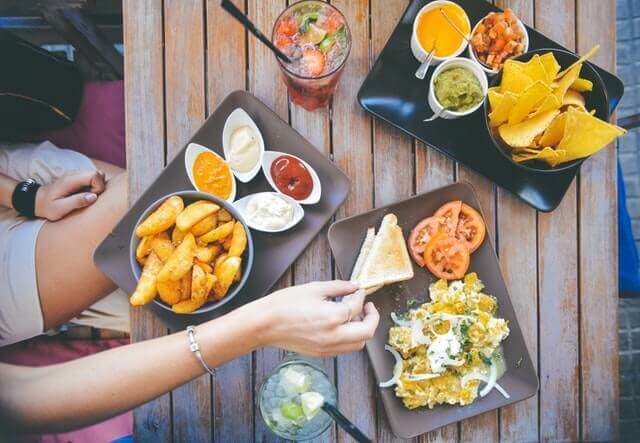 In addition, this region boasts some of the best restaurants in Victoria, you can enjoy delicious food made from organic produce sourced locally complemented by a glass of silky red wine. Mount Dandenong is a national park located 35 km east of Melbourne CBD, it is a popular weekend getaway for locals thanks to its lush rainforest and mountainous environment. There is a number of gorgeous gardens on the mountain, the most famous ones are National Rhododendron Gardens and William Ricketts Sanctuary, surrounded by a number of orchards and berry farms around Dandenong Ranges, making it one of the favourite tourist destinations near Melbourne. Its 633 meters high observatory offers a spectacular view of the nearby areas and metropolitan Melbourne.